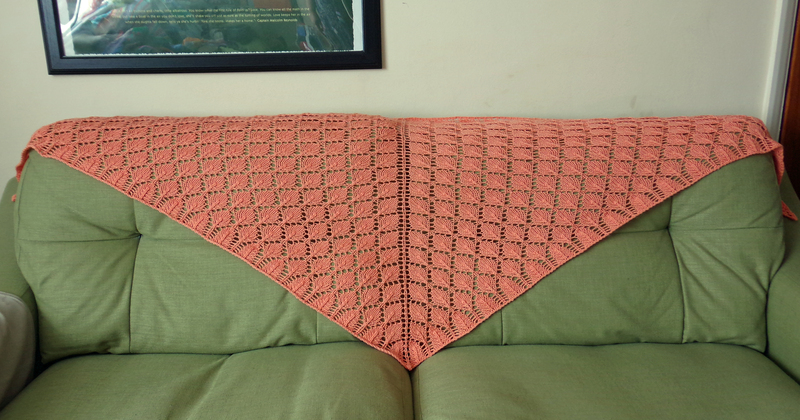 Knitted sugar leaf shawl finished! My last post was a very sad one, and before I move on to happier subjects I’d just like to say thank you to everyone who took the time to read, like or comment on it. Meredith was a wonderful little cat and it was kind of you all to spare a thought for us. Anyway, happy thoughts! I have a finished project to show off. 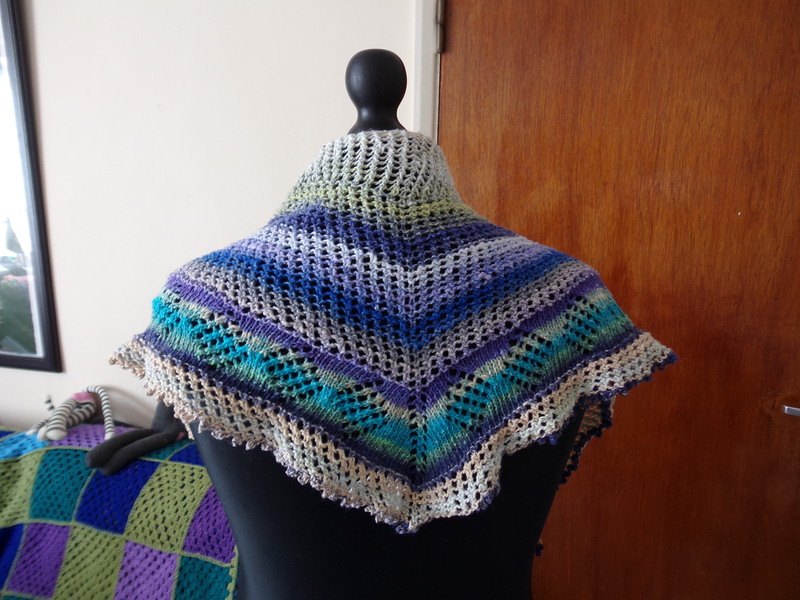 It’s the shawl I’ve been knitting in Araucania Ruca, which is a deliciously soft yarn made from 100% sugar cane. 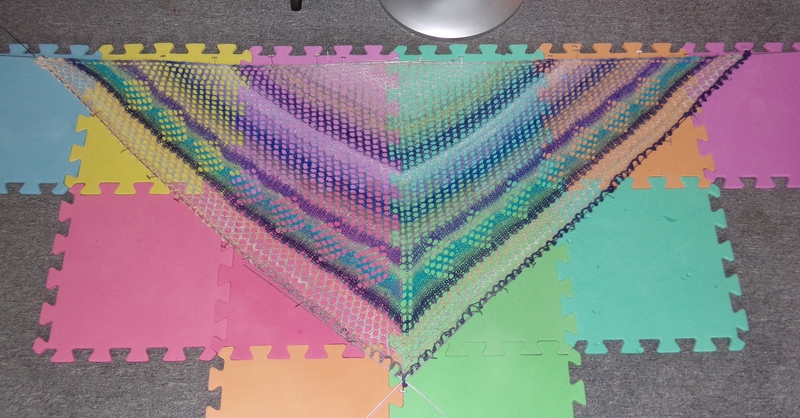 It took two 100g skeins which works out at a total of about 482m for the whole shawl, and it always amazes me how much further yarn will go if you knit with it instead of crochet! 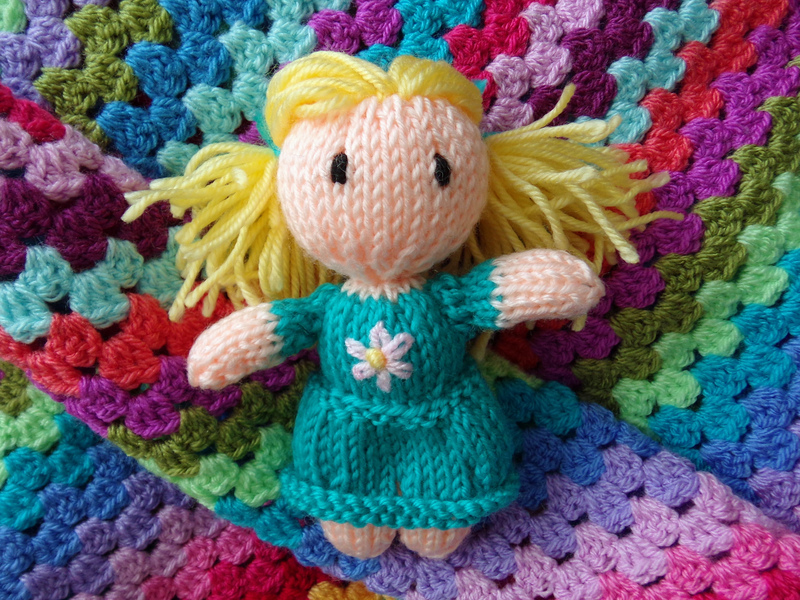 I tend to think of myself as a crocheter. 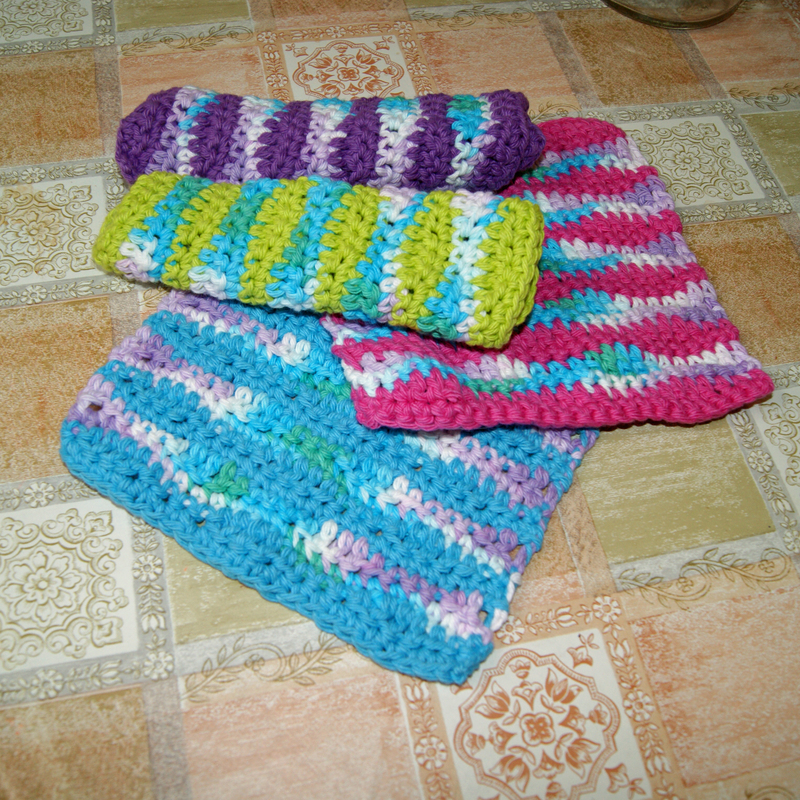 That’s not to say I can’t knit, I just prefer to crochet and I honestly couldn’t tell you which craft I learned first. At the beginning of the year I decided I was going to knit myself pair of socks every month, and that lasted until I finished my second pair. 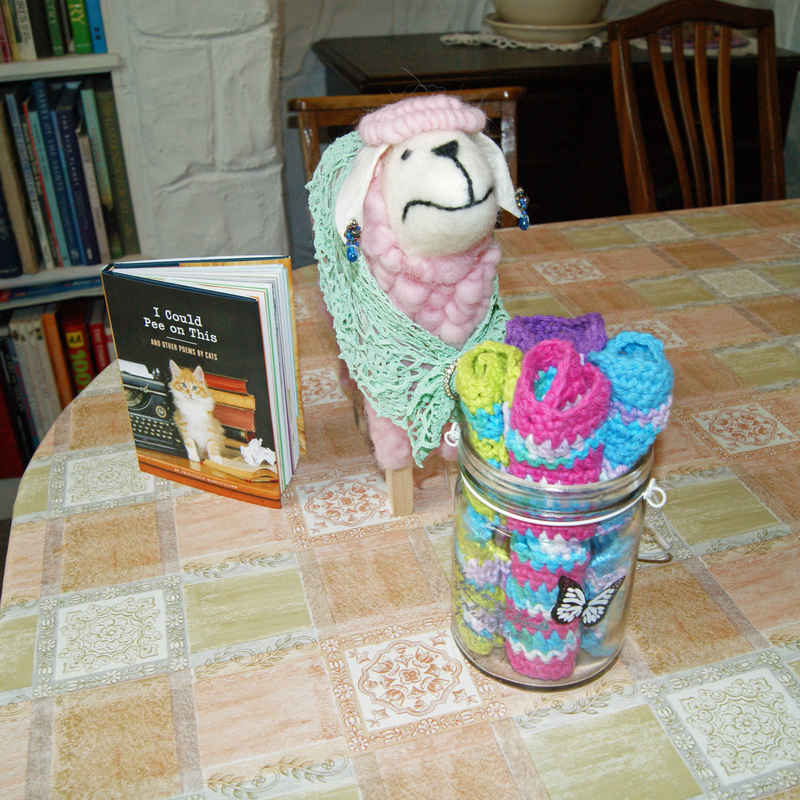 I had the wool to make March’s pair…. but it never happened. 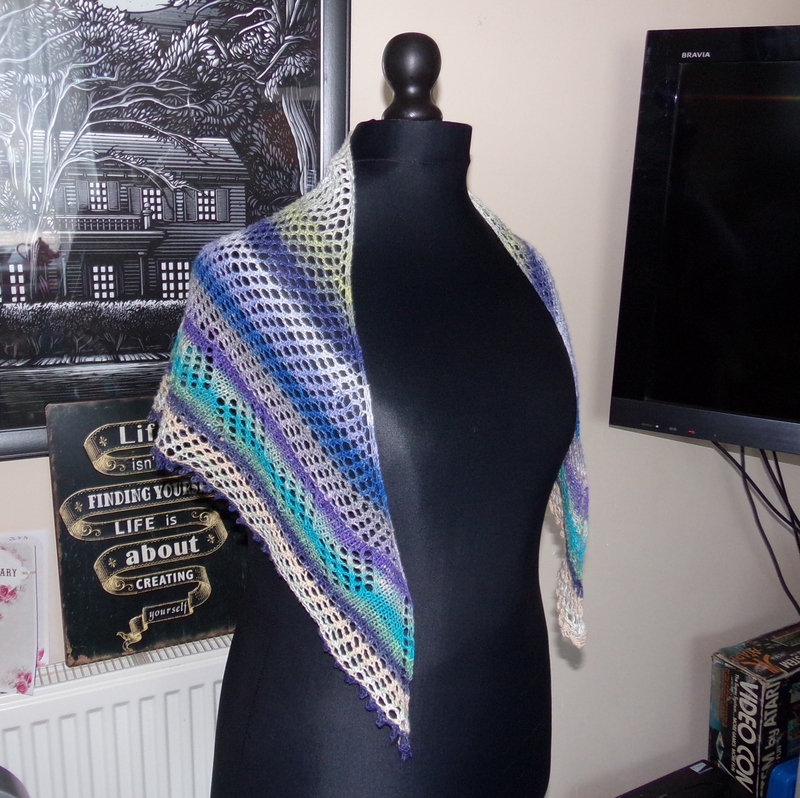 I’d bought some Noro Taiyo 4 ply in a sale online a while back, and a quick poke around through the free patterns on Ravelry turned up the Rosalie Shawl pattern by Sharon Jane. 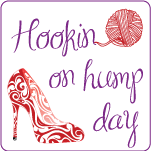 I sprung for some Pro Style Symfonie interchangeable circular needles and I was good to go! 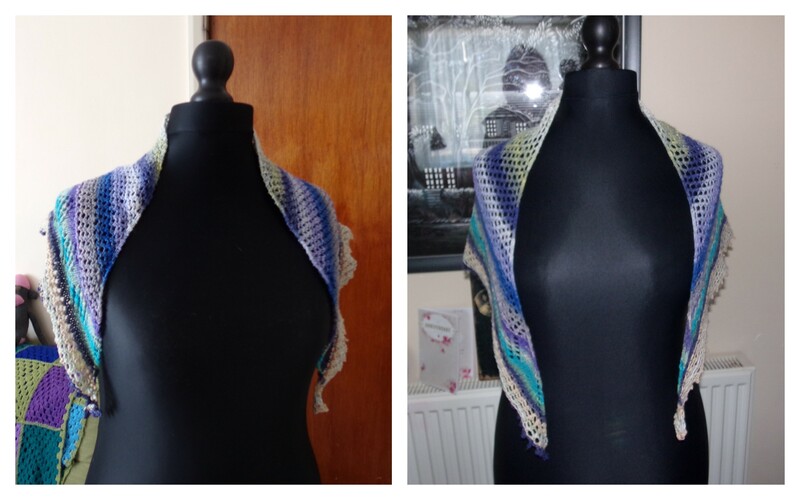 It only took a couple of weeks of on and off knitting, and then I had my very first knitted shawl! I was really impressed with the pattern, and it was just the right level of difficulty for someone having a go at lace for the first time, with a gorgeous band of diamonds and a picot cast off to give it a lovely elegant edge. 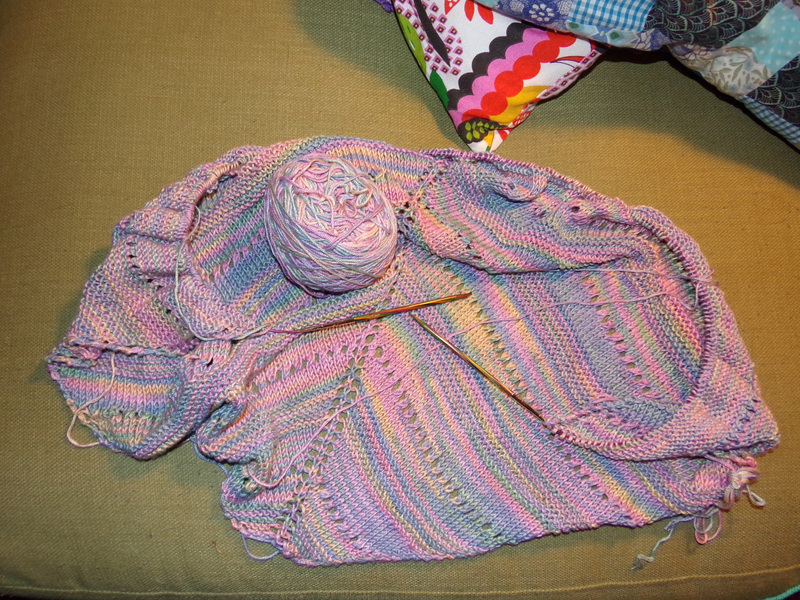 It was fairly unimpressive size-wise until I blocked it, and although I knew this would be the case, I was still shocked at what a difference blocking it made. The difference is even more dramatic when viewed from behind. It was pretty scary blocking something so delicate. The yarn is a slubby single ply composed of 50% Cotton, 17% Wool, 17% Polyamide, 16% Silk, so it doesn’t take much force to break it. 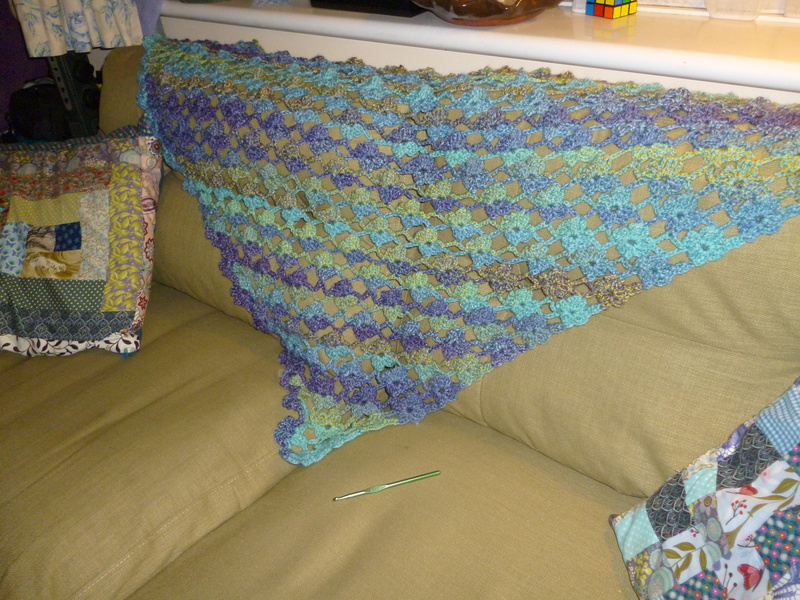 I’d never tried blocking something so big before either so I did a bit of research before attempting it. I soaked it in a solution of water and Eucalan No Rinse Delicate Wash for 15 minutes (the yarn band did say no soaking and the Euclan said soak for minimum of 30 minutes, so I nervously split the difference , which seemed to be fine). I then placed it between two towels, and squeezed the excess moisture out. So far, so good. I was doing everything I’d been told to. Next came pinning it out. 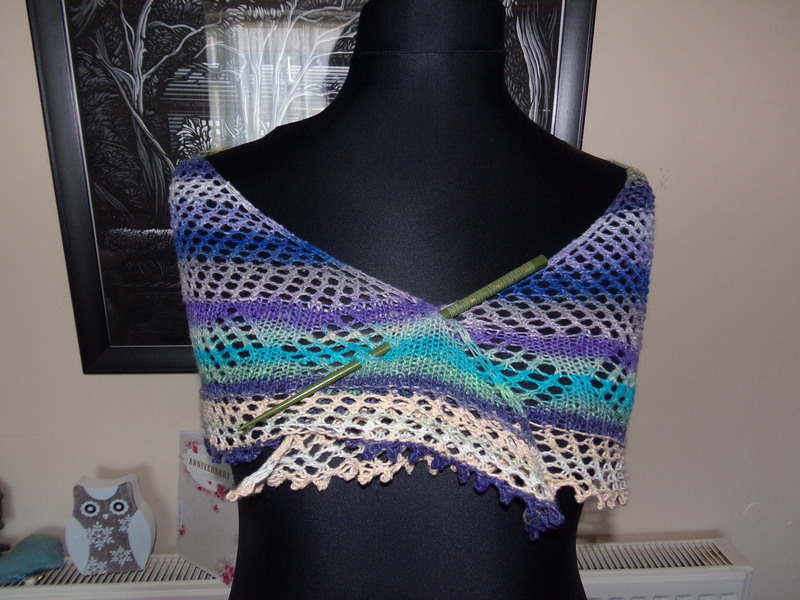 I decided to use blocking wires, which was fairly straight forward. I’m still not convinced I pinned it all out straight, but I’m willing to bet it was better than if I’d just winged it without the wires. T pins are definitely the way to go with blocking; there is less risk of the pin pulling right through your work. I generally use interlocking foam play mats rather than the much more expensive purpose made blocking ones. They worked okay, but I found I had to stick the pins right through them and anchor the whole project to the carpet underneath – a process that would have been considerably easier without a certain cat trying to interfere! If I had a deeper pile carpet I could probably get away with pinning everything directly to the floor like my mum does. 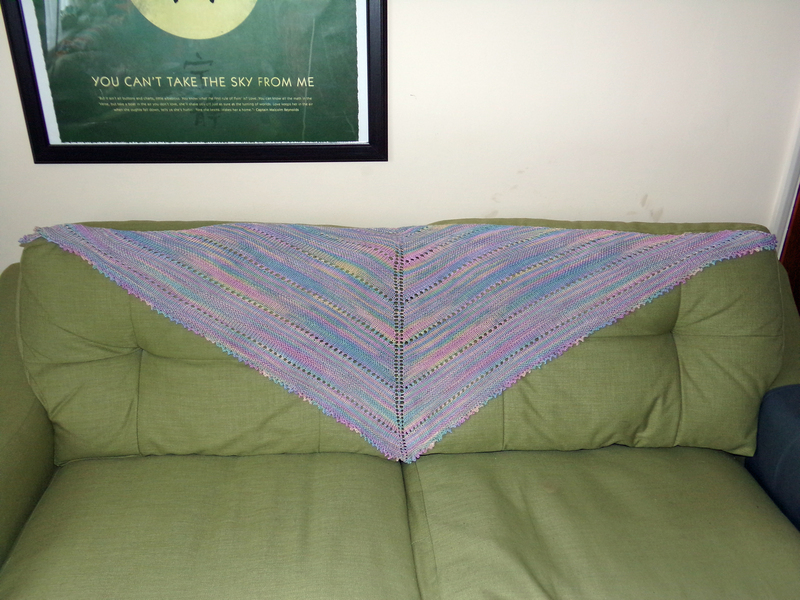 I blocked the shawl as hard as I dared, and I was thrilled with the way it turned out. The gradual colour changes were perfect for this pattern, and I love the way the bright blue falls on the diamond lace panel. I don’t own a shawl pin, so I had to make do with a pretty chop stick instead! I don’t think knitting will ever really steal away crochet’s special woolly place in my heart, but I definitely have a renewed affection for the Dark Art, and I’ll definitely be knitting more often. I’ve written a formula for knitting bunting – it’s far too simple a thing to call a pattern, but I’ll be sharing it here soon – and I’ve already started another shawl, this time in super soft, slippery viscose. 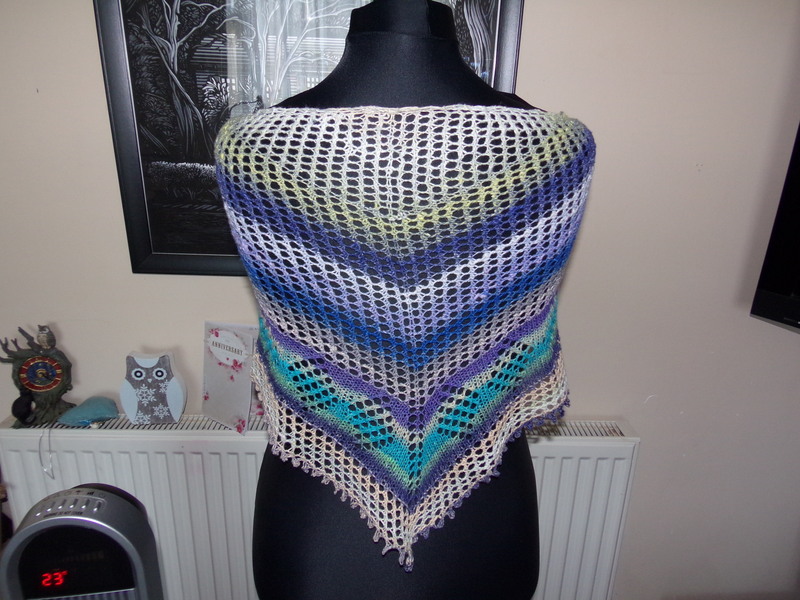 Knitted or crocheted, shawls are awesome. Is anyone else making one?